Maggie June (Pool) Spronk was born on January 30, 1926, to Simon and Bertha (Van Peursem) Pool on the family farm in Leota Township, Nobles County, Minnesota. She grew up on the farm and then moved to Edgerton, Minnesota, with her family when she was 10 years old. She attended school in Edgerton, graduating in 1943. She was united in marriage to Bernard Spronk on February 6, 1945, and the two were blessed with four children and 64 years of marriage together. Bernard enlisted into the United States Navy and upon his return, they farmed for 37 years together. After their retirement in 1984, the couple moved into Edgerton. Shortly before Bernard’s passing, Maggie moved into her condo in Edgerton. 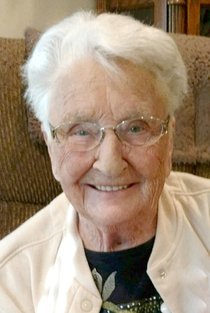 Maggie continued to live in her home until two weeks ago when she was admitted first to the Pipestone County Medical Center and then to the Avera McKennnan Hospital in Sioux Falls, South Dakota. She entered into the Sanford Luverne Hospice Cottage on Tuesday, December 5, and passed away there peacefully on Wednesday, December 6, 2017, at the age of 91 years, 10 months, and six days. Maggie made her profession of faith at First Christian Reformed Church in Edgerton and later became a member of Bethel Christian Reformed Church. She participated in Bible studies and work groups. She was also a member of the Southwest Christian High School Circles and the American Legion Auxiliary. She enjoyed gardening, flowers, crocheting, and doing puzzles. She went on many bus trips with Bernard which they truly enjoyed. She always loved time spent with her children, grandchildren, and great-grandchildren. Maggie is lovingly remembered by her children, Rod (Linda) Spronk of Edgerton, Gloria (Roger) Fey of Edgerton, Delwyn (Julie) Spronk of Faribault, Minnesota; 13 grandchildren; 34 great-grandchildren; one brother, Duane (Barbara) Pool of Redlands, California; and many loving nieces and nephews. She was preceded in death by her husband, Bernard; her parents; one son, Verlon; a brother, Oscar; and one daughter-in-law, Kathy.